The Iowa Great Lakes Association (IGLA) considers BOB a major threat to our environment on the same level as Zebra Mussels, Asian Jumping Carp and CAFO’s. BOB may be the greatest threat to the Aesthetics Oak Trees give to our lake homes and surrounding areas. We have been warned many times to protect our Oaks and unfortunately most of us over the years have taken our beautiful Oaks for granted. Close your eyes and imagine what our summer would be like without our beautiful Oaks and instead we are surrounded by corn and soybean fields. As we have investigated Bur Oak Blight, we have encountered much misinformation. The purpose of this report is to bring clarity to this misinformation and suggest treatment resources for you to consider… Remember BOB is contagious and what you do or don’t do will affect your neighbor. What is Bur Oak Blight [BOB]? What % of the Lake’s trees have Wilt/Blight? Do some neighborhoods have a higher rate of infection? There is no cure for oak wilt. Bur Oak Blight can be controlled in some areas with chemical injections. Propiconazol have been most successful in controlling Bur Oak Blight. However, some chemical burning (phytotoxic effects of the chemical) does occur. Follow the all labeled instructions. Propiconazol has been well tested. What months in the fall or spring should trees be injected …why? Spring injections, just after the leaves have expanded, is the absolute best time. That is when the majority of the chemical will move up into the canopy of the tree where Bur Oak Blight is found. The spring rains and actively growing tree assist with the chemical uptake. We have tried summer injections and have had varying success. You really have to water the tree heavily for several months to assist the uptake. The uptake can be highly variable if the tree starts to go dormant for summer. Fall injections have had the least success. The chemical moves down to the root system were it sits until next year. It is suspected but has yet to be confirmed that the chemical starts to break down and is no longer concentrated enough to provide the needed control for Bur Oak Blight with fall injections. How often should trees be injected? This varies by tree, success of the chemical uptake, and climate. 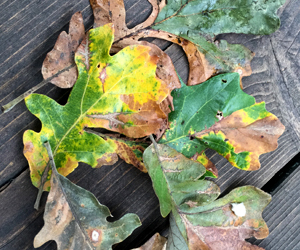 On average, it takes BUR OAK BLIGHT 5 or more years to build back up in the environmental when conditions are favorable for the fungi. One of the experts has followed a tree that was injected 6 years ago and has very little Bur Oak Blight showing. Not enough to consider reinjecting. It could be as long as 10 years or more. We simple do not know. There are too many factors. The key is getting the best chemical uptake to set the fungi back. It takes many years for it to get reestablished. Who do you cite as experts on Bur Oak Blight? Dr. Thomas Harrington, ISU. Dr. Jenny Juzwick USFS. Tivon Feeley, IDNR. Are you familiar with Arborjet if so what do you think of their injection systems? Iowa DNR uses the system and it works well. They have also used other systems with success. They will not recommend an injections system. What is the DNR’s strategy for the treatment of the Bur Oaks on public land located around the Great Lakes? DNR does have several Arborjet injection systems and use propiconazol for spring injections in key locations at all of our State Parks. We are unable to make a recommendation for any of the Lakes area entities who have made a commitment to the treatment of Bur Oak Blight (BOB). What we can do is give you a list of three we have found and you can make your own decisions who you want to use. Here they are in alphabetical order. The Iowa Great Lakes Association, or IGLA, hosted a gathering of members and guests on Saturday, June 11 with a focus on Bur Oak Blight. Click here for the story on KUOO/Explore Okoboji.